Who wants to have the panorama of nature view and see the beauty of bandar raya Miri from a high building above while enjoying a tasty dish? 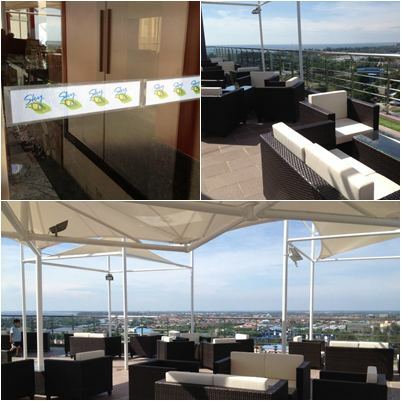 Thus, to those who want to enjoy a wonderful experience like this, visit to Sky Garden at Meritz Hotel Miri. Sky Garden is located on level 17 of Meritz Hotel’s building, first opened its doors to customers starting April 18th, 2012. Sky Garden that runs 6:00 p.m. till 10:00 p.m. on a daily basis with promotion on weekends, is very suitable to be used as a location for advocating various Council of either formal or family shaped like a day and so on. The visitors will have a chance to see a panorama of the Miri airport Highway which is definitely promising beauty by combining the views of hills, the sea and the city. According to them, the promotion of ‘steamboat’ is to be found in three different size with an offer price. For small size i.e. for two people only, the price offered is RM60, medium in size (4 people) is RM120, and the large size (6 people) is RM180. In addition, they also provide drinks wine and beer at the buy one get one free one package over the period of the promotion.